The Peak Tram is one of the earliest public transportations in Hong Kong. 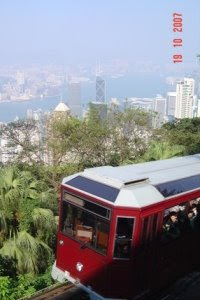 It is a funicular railway and is the shortest yet most scenic route to the Peak of Hong Kong. The whole journey takes seven minutes with four stops. Peak Tram is not only a vehicle, it is a unique experience of your Hong Kong travel. It takes you up an incline as steep as one in two, almost perpendicular at some points. Buildings look like they are leaning at a 45-degree angle. They just look like a jungle of buildings with extreme density. It’s going to be an unforgettable experience. Peak Tram town station is located at Garden Road in Central. It is just a minute’s walk from the Bank of China Tower or the Cheung Kong Center. It is connected to Central Pier 7 (next to Star Ferry) by open-top bus number 15C. If you want to go to the Victoria Peak, this is a great way to experience Hong Kong.